The jigsaw of land resources, population growth and the changing needs of society make Singapore’s use of space a tricky puzzle to tackle. However, when all the pieces fit perfectly, the big picture comes into view and the final result benefits many for generations to come. Taking constant challenges head on, SLA is on a ceaseless mission to strike gold with innovative solutions for maximising the use of limited land. It’s a rewarding journey, and the first step begins here. 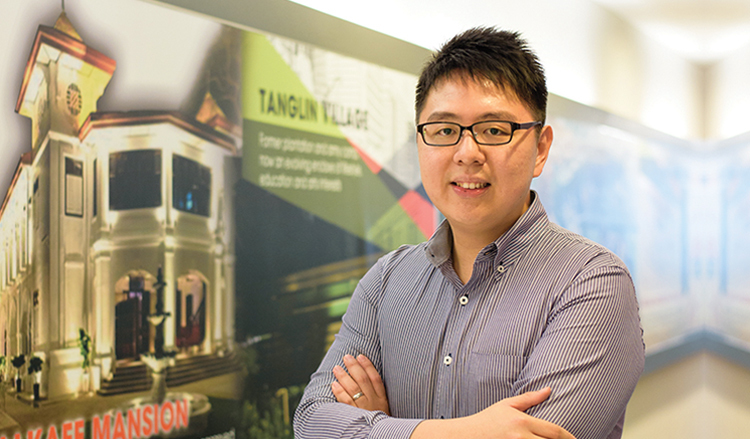 Starting out as SLA Undergraduate Scholar and subsequently SG GeoSpatial Overseas Postgraduate Scholar, Eric Koh has since expanded his role to play a bigger part in the development of Singapore. He currently wears two hats as Assistant Manager of the GeoSpatial Planning & Policy unit as well as Data Services Team member in the Geospatial & Data Division of SLA. Eric shares with us how the SLA scholarships have benefitted him and what scholar hopefuls should take note of before making the crucial choice. Why did you choose to take up a scholarship with SLA? SLA is the leading agency on geospatial matters. Besides the use of GIST [Geographic Information Systems and Technology] in various core functions within SLA, SLA is spearheading the development of the GIST landscape in Singapore. Since I had my mind set on pursuing my interest in GIST, the decision to apply for the SLA scholarship was a definitive one. Tell us about the scholarship benefits you received. SLA allowed me to undertake an industrial attachment to further skills and knowledge that I had learnt through my Master’s programme. I was with the Open Data Institute in London as a research fellow to undertake research on smart cities and the use of geospatial and open data. What is your role in your current position? My core responsibility in the Geospatial Planning and Policy unit is to help formulate and implement strategies to proliferate the use of GIST across government agencies. At the Data and Geospatial Services Department, which I have recently joined, my team and I are involved in the handling of day-to-day operational requirements from SLA and across other governmental agencies. What were some of your memorable episodes in SLA? One of the major challenges (and conversely, also the biggest opportunity!) is to continually discover, recognise and unlock value in the work we do. Many times, when we are caught in the midst of our daily work, we might not immediately recognise the value in the work that we do. But accomplishments are rarely the work of one, but that of a collaborative team! To achieve that, we proactively share our work experiences and insights with one another. How does SLA help scholars transition into working life in the organization? I was assigned a mentor who had given me valuable advice to prepare me for the working life. The internship was beneficial on various levels. I gained direct exposure in working on real-world operational issues as compared to working with hypothetical case studies in school. Any advice for those who wish to follow in your footsteps? Remember to I.N.N.O.V.A.T.E. when you commit to a scholarship! Innovation – seek out new ideas through collaborations and synergies. Nation-first – keep Singapore at the heart of what you do. Never give up – keep your chin up (or the tummy full) during tough times. Openness – be willing to share your experiences and insights with fellow colleagues. Value-add – continually discover, unlock and also recognise value in your day-to-day work. Achieve – strive to achieve personal learning goals and not forget the importance of life-long learning. Teamwork – embody the notion of ‘Together, Everyone Achieves More’. Enjoy – take pride in the work that you do, the people that you meet and the experiences that you will have. Find out more about SLA’s Undergraduate Scholarship and Singapore GeoSpatial Scholarship. A fascinating career with diverse opportunities awaits aspiring engineers at ST Engineering!